Once again we are happy to move our attention on a book by Stephen Cooper. 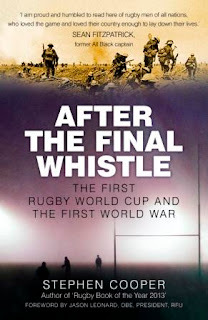 His newest After the Final Whistle (Spellmount Publishers Ltd) is again about rugby and of course about rugby during the Great War years. We had a nice dinner in Varago (Maserada sul Piave, Italy) in September 2014 talking about the progress of the book and the new researches involving also the territory of Italy. The book has been released last year during the Rugby World cup. Here below is his interview for which we thank him. Q: "The Final Whistle" and "After the Final Whistle". Already in the titles, it seems there's a clear connection between your two books dedicated to rugby and the First World War years. Could you explain this connection? A: All history writing is work in progress because the past continually gives up more of its treasures. At the time of publication of ‘The Final Whistle’ I had discovered 87 rugby players from Rosslyn Park who had died in the Great War; now the total is 109. The book itself gave new impetus to the quest, both for me and for readers who contacted me with possible names, but also stories of other players from other clubs and countries. Although I started to work on other projects (like a novel) I found the subject would not let me go; it even ‘followed’ me wherever I went. In September 2014, I found myself staying in a XVI century villa in the Veneto; on the wall of my room was an English hunting print from the 1850s, showing the home and father of one of my rugby players. There was also a sense of unfinished business for me. As a new writer with ‘The Final Whistle’, I was nervous of talking about my personal inspiration, preferring to keep the book an objective history. As far back as 2009, I had taken a junior tour to Compiegne in France, where we played a memorial game against a French club which had lost 58 of its 120 members. An army officer addressed the teams before the match and said (in French): ‘rugby and warfare share a common language, but we must remember they are very different.’ This directly led to the first words of my book, where I explored that language of rugby and war. But I never really examined WHY rugby and the military should be so closely connected. Two months after my return from Italy in 2014, I chanced across a reference to a rugby tournament played in 1919 by soldiers returning after the Armistice. The tournament was known as the King’s Cup. Teams came from the armies of Australia, Canada, New Zealand South Africa, France and Britain. I realised this was in effect the first ever world cup, long before rugby created its first official one in 1987 - and even before the first football competition played in Uruguay in 1930. With the Rugby World Cup arriving in England in September 2015 in the middle of Great War Centenary commemorations, here was a great opportunity to examine the rugby/war link again. Q: How did you collect the material that gave life to this second book? A: For once - now I had become an experienced internet researcher - I found there was very little information on the web about the King’s Cup. But perhaps in the early days I did not know where to look. There were no books ( which was good for me!) and only a few brief mentions. In order to persuade myself (and my publisher) that there was enough material to make a book, I went to the archive of the World Rugby Museum at Twickenham. An afternoon of reading contemporary accounts convinced me there was a book to be written. It would be called ‘After The Final Whistle’ because the King’s Cup was played in a new springtime of 1919, after four hard years of war, but it would be a companion to my first book, not a sequel. I also decided that I would cover all the rugby nations of the era (including USA) and necessarily include stories of survivors, not just those who were killed. This, after all, was the message of the King’s Cup- we have survived, it’s time to return to peaceful ways and sport again, and build new nations and a new world from the ashes of war. Once the research started in earnest, I encountered the same wonderful enthusiasm around the world as I did with my first book. The Rowers Club in Vancouver, Canada, told me their story and sent me material. At the Oxford Cambridge Varsity match in 2014, I met many South African ‘Blues’, which led me to the unpublished diary of Frank Mellish, who was a wartime artilleryman, and played for England and the Springboks after the war. Contacts in Italy, France and Australia were unfailingly helpful. A twitter contact sent me pictures and letters from his club in Glasgow. And I spent a small fortune on Amazon and eBay tracking down old rugby books. When that failed I spent many hours in the wonderful British Library, reading books that cannot be found anywhere else. Q: How long did it take to write this second book and how long did it take to write "The Final Whistle"? A: . ‘Final Whistle’ took me 2 years. This book took 10 weeks – my publisher awarded the commission on 2 December 2014 and gave me a deadline of 16 February, in order to meet publication in time for the Rugby World Cup. I had to write in personal time, as I was merging two charities in my dayjob. I set myself a target of 2000 words every day and did the research as I was writing. I worked on Christmas Day and, as the deadline approached, was awake most nights at 3am, tapping away at my computer. Q: What did you change in your approach to writing (if something has changed, of course)? A:I kept the same very personal style. Not everyone likes it, but I thought it was important to have some humour and present day references, and not just write a dry academic history. But, crucially, I wanted to celebrate the human triumph of those who lived, not just mourn the tragedy of those who died. I wanted to span the big international players and their national teams right down to the small clubs and the unknown men. I also explored sidetracks and byways, simply because they interested me, and I thought readers would enjoy them. And I wanted to look forward to today where rugby can play an important part in healing conflict, as the inspiring work of Asad Ziar the founder of the Afghan Rugby Federation proves. I described my first book about 15 men as a ‘portrait in miniature’; this is painted on a much bigger global canvas. Q: Are you promoting the new book? Where and how? A: The book was published in the UK in August 2015 in time for the World Cup. I spoke at a number of literary festivals and there is a podcast from the UK National Archive (actually two). It has sold well since the RWC ended - I think readers were too busy watching the games! Around the world, it is easiest to find it on online bookshops like Amazon. It has been released in USA/Canada and Australia, but it is a book to be discovered. Q: Could you suggest other book titles related to sport during the First World War? A:. Clive Harris and Julian Whippy wrote an excellent book of sportsmen’s biographies in ‘The Greater Game: Sporting Icons who fell in the Great War’, as did Gavin Mortimer in ‘Fields of Glory’. ‘The Final Over’ by Christopher Sandford is all about English cricket in summer of 1914. Gwyn Prescott’s fine ‘Call them to Remembrance’ covers Welsh rugby internationals. Andrew Riddoch wrote ‘When the Whistle Blows: the story of the footballers battalion’. In French there is La Melee des Tranchees by Francis Meignan. Floris Van der Merwe has written ‘Sporting Soldiers: South African troops at play during World War 1’. Q: Are you already imagining a third book? Thanks for your time. A: So many stories from my first book haunt me and they now inspire my ambition to write a novel (I have done enough non-fiction history), especially the story of Robert Dale, the kite balloonist, who died in 1918 and now lies in Giavera cemetery. I am also working on another set in Sicily (a long story full of magical realism) and have an idea for a prison camp story in Berlin. Too many stories, not enough time.